A Judge has ruled that the NC General Assembly has the right to write rules for building access and conduct. Superior Court Judge Carl Fox rejected arguments that the building rules were illegal. The two who will be standing trial are Carol Anderson and Dale Herman. Remember, the people attended a meeting, volunteered to be arrested and were given a special armband to designate they were doing it. Carol Anderson was arrested twice at the legislature; once on May 13, 2013, and again on May 16, 2016. 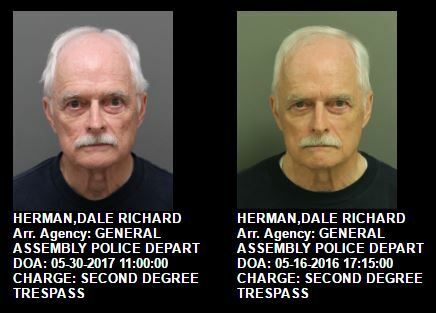 Herman has also been arrested twice during Moral Monday protests. Remember, Moral Monday created the need for more defined rules with their repeated ‘arrests for media attention’ tactics. This ruling means no more free passes for the repeat offender Moral Monday protesters – if there are any more arrests since it seems like Moral Monday has died out. I’m not kidding about repeat offenders. Getting arrested: It’s a family affair. Pete Kaliner of WWNC Radio laid out this issue quite succinctly. A snippet below; MoMos is the nickname for Moral Monday protesters. Yesterday, the GOP clarified these rules … and the MoMos are mad. This entry was posted in CRIME, LL1885, Moral Monday, NCGA, POLITICS NC, THE LEFT and tagged Moral Monday, NCGA. Bookmark the permalink.